Craving barbecue, seafood, burgers, or lighter fare? Whatever your taste, Restaurant.com has your place! 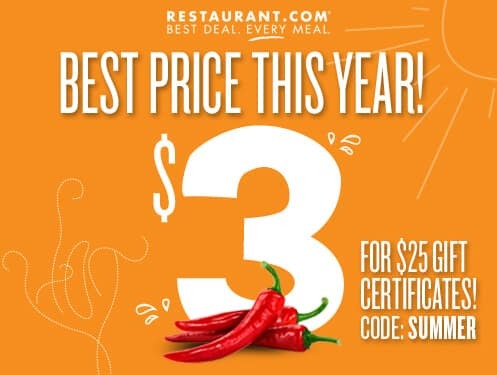 The trusted and valued source for connecting restaurants and diners nationwide is offering a one day only sizzlin’ hot $3 for $25 deal Friday, June 20, with promo code: SUMMER. Grab your Restaurant.com $3 for $25 Gift Certificates today and be on your way to dining bliss! Disclosure: This post brought to you by Restaurant.com. All opinions are 100% mine.